NMS is a system that maintains the phone numbers that are assigned to a telecom operator, including data about the numbers that are assigned to the operator’s end-customers. The number series is organized in different systems and subsystems. Numbers can be presented according to different search criteria and be booked or reserved to an end-customer. Links to the lateral system can be developed as extensions, such as downloading customer data. As an additional service, numbers that are ported in or out can be updated automatically. 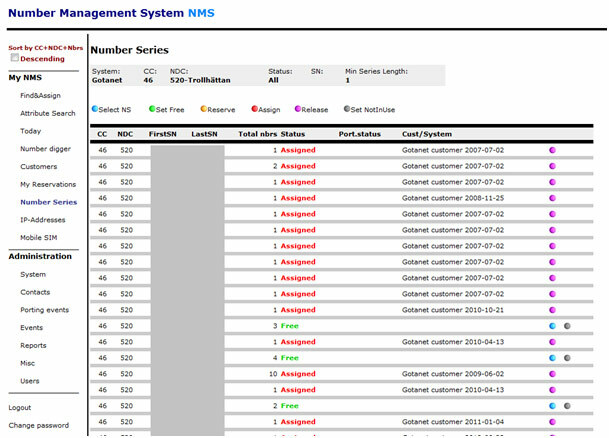 NMS is a web interface with four different permission levels, where the first level is read only and the highest level gives total control of everything in the system. It is also possible to restrict users to only access certain parts of the system and/or certain customers. In addition to the web interface there is also a SOAP API where basic functionality is exposed, such as ability to book/reserve a free number for a customer. In addition to the management of telephone numbers, there are also optional modules for management of SIM cards and IP addresses. These features are available for exposure in both the web interface and the SOAP API.